10 Effective tips to deal with acne - The perfect home treatment! 10 Effective tips to deal with acne – What are the causes of acne? The American Academy of Dermatology claimed that acne is one of the most common skin problems. In America, 85% of teenagers get trouble with acne; many of them suffer from serious symptoms such as scars when the acne leaves. Nowadays, it is not so difficult to treat this skin disease. More and more people consider natural remedies to treat acne instead of meditation as they are very effective and harmless to their skin. 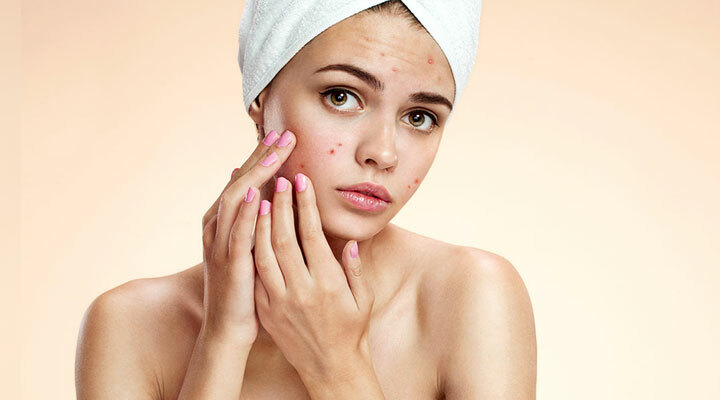 Our article following will introduce you some easy but effective tips to deal with acne naturally and fast. However, firstly, let have a look at its causes. The clogged pore is considered to be the main cause of acne. As too much oil and dead skin cells are produced on your skin surface, the pores are clogged so the bacteria remain on your skin and cause acne. The imbalance of hormone also leads to the appearance of acne. For instance, teenagers often get more acne than people at other ages because the androgen hormones in their bodies produce more oil than normal. If they do not clean it in a correct way, the oil will remain in their skin and cause clogged pores and acne. A poor and unhealthy diet with much of sugar and fats contributes to the formation of acne. You can get acne easily if you have a high level of stress or sleep disorder. In the modern life, because of the effects of urbanization, and social pressures, people are easy to get stress, depression, anxiety or other mental problems. This situation, if it lasts for a long time, will seriously affect our health, not only our appearance. Smoking and inflammation caused by the surrounding environment can also cause acne. If you have acne, it seems that your skin has more oil than normal. It is necessary to carefully clean your skin to remove all of the dust, makeup, sweat, and prevent clogged pores. If you do not wash your skin regularly and carefully, the dust will seep into your skin layers and cause acne, blackheads and many other skin diseases. How do I make my face look younger? 6 great tips to look younger! Exfoliation will help to remove all of the dead skin cells on your skin surface and prevent the bacteria from harming your skin. Exfoliation is also a good way to facilitate the activities of oil glands under your skin and promote its work to nourish your skin. However, not every people know how to exfoliate their skin in an exact way. You should exfoliate your skin once per week and remember to use a moisturizer after exfoliating, or else, your skin will become weak and dry. As we recommended above, foods including a high level of sugar, and fats can increase the risk of getting acne. Moreover, you should also cut down the consuming amount of pasta, bread, and white rice but consider more vegetables, beans, and whole grains. Taking Omega-3 fatty acid is always good for acne patients. This type of acid has the ability to manage leukotriene B4 – a substance that causes inflammation and sebum – the root cause of acne. You are advised to consume more foods such as walnuts, salmon, and flaxseed oil as they are magic supplements of Omega-3 fatty acid. Some people often hesitate to apply sunscreen before they go out because it is quite time-consuming. However, scientists consider this as one of the most important steps to deal with acne. The reason is that sunburn can cause inflammation to our skin and worsen the acne besides causing many dark spots on our skin. However, not all types of all sunscreen are useful enough. When buying a sunscreen, you should pay attention to the ingredients on its back. If you are easy to get acne, you should buy a product with avobenzone, zinc oxide, methoxycinnamate, and oxybenzone. On the other cause, if you are an acne patient, a product with noncomedogenic is highly appreciated. As we recommended above, stress is one of the main cause of acne. Doing exercise will help you to reduce stress and remove the acne effectively. Moreover, physical activities will help you to boost the blood circulation and provide more oxygen to the skin cells. This activity will help to keep your mind strong and relaxed after a hard working day. However, you should remember to carefully take a shower after doing exercise to make sure that you remove all of the sweat from exercises. Taking dairy can cause many negative effects on the acne treating process. Milk and dairy may give changes to your hormone and cause acne easily. People who consume a high amount of dairy and milk have a higher level of getting acne in comparison with those who drink less. So, cut down the amount of consuming dairy to make sure that your acne treating process will be effective. Nourishing your skin is a good way to prevent dead skin cells – one of the main causes of acne. You can use aloe vera – a natural tropical plant with clear gel on its leaves – to take care of your skin. Aloe vera gel can help you to heal the rash, treat many types of skin diseases and especially fight the inflammation to treat acne. Aloe vera is also rich in sulfur, which is considered as a powerful acne treatment. In addition, it is said that the salicylic acid in aloe vera can help you to remove the acne effectively. For all of the above benefits, do not hesitate to use aloe vera if you have trouble with acne. There are some certain reasons why green tea is so popular for beauty and health care. This ingredient is rich in catechine, which can effectively treat the bacteria causing acne. Moreover, the antioxidants and anti-inflammatory properties of green tea can help to reduce the redness from acne and protect your skin from radicals and other environmental factors. These substances will also help you to reduce the acne scars and slow down the aging process. Regular use of green tea is an effective way to lighten your skin tone, unclog the pores and treat acne. Here are the directions on how to use green tea to deal with acne. Repeat this process twice per day to get rid of the acne completely and naturally. Besides using green tea, you can also use apple cider vinegar to destroy the bacteria that cause acne thanks to the appearance of acetic and lactic acid in this magic ingredient. Using apple cider vinegar will help you to not only reduce the acne but also prevent the acne scar. Thanks to the appearance of organic compounds and succinic acid, apple cider vinegar is considered as a powerful treatment for inflammation, acne and even acne scar. It is not so difficult to use apple cider vinegar for acne treatment. Here are the directions for you. Finally, rinse it off with clean water and then apply a moisturizer for the last step. Wash off with warm water and apply a skin toner for the last step. You are advised to apply this remedy every day to get rid of your acne skin quickly. Have patient for best result! Above are 10 easy but effective remedies and tips to deal with acne that you should strictly follow. If you are patient and industrious enough, you will achieve the result soon.